well i'm here in VA, finally. I met the mission president and wife and i also met the A.P. 's, they are all very nice. so far i was picked up from the airport and then went to the mission home. then we ate and took pictures. i have a couple of interviews tonight. i don't know who my comp. is or my area until tomorrow. tomorrow i go to my area and start preaching, pretty exciting! FYI my p-day is on Tuesday now. well i don't really know what else to say except i'm really well and excited to serve. I love you all. We were pleased to welcome your son, Elder Kyle David Pierce, to the Virginia Richmond Mission. We love him already and are aware of his great potential to be an excellent missionary. He spent one day with us receiving orientation, and he is in good health and good spirits. His drive and determination will be of tremendous help as he joins a wonderful group of missionaries already serving the Lord in this area. Elder Pierce has been assigned to the Chesterfield Zone. 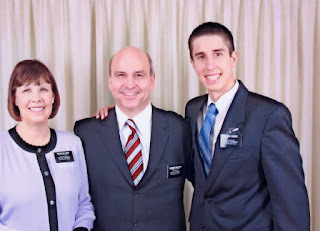 His first companion, Elder Jacob Michael Martinos, is an excellent missionary who will do an outstanding job training your son for his service to the Lord. All mail and parcels should be sent directly to your missionary. His new address is: 11700 Lake Falls Dr. Apt. 401 Chester, Virginia 23831. We invite you and your family members to read The Book of Mormon: Another Testament of Jesus Christ, while your missionary is in the field. As you prayerfully and earnestly read this book, you will increase your understanding and faith in the plan of our Heavenly Father. We are thankful for the part you played in preparing Elder Pierce to serve this mission, and we are honored to serve with him. Enclosed is a photo we took upon his arrival at the Mission Home(above). May the Lord abundantly bless you as you supposrt him in this call.